Using a major construction project to reconnect the neighbourhood. Edmontonians are starting to use the City’s Neighbourhood Renewal program to refresh not just roads and sidewalks, but renew how their community fits together. Queen Alexandra has grown along with Edmonton. Once a part of the former City of Strathcona, it hit its highest period of growth in the 1960s with single detached homes taking up the majority of builds. But today, the neighbourhood is slowly filling in with condos, low rise apartments and infill properties meant to increase density beyond single-family homes. As the new buildings go up, people move in — and repairing roads for what the neighbourhood used to be no longer made sense to its residents. “We shouldn’t be designing it for ‘like for like,’ but for what our community needs now, and what our community needs 50 years from now,” says Julie Kusiek, Queen Alexandra resident and founder of QA Crossroads, a committee of the Queen Alex Community League. Kusiek and her neighbours quickly saw an opportunity to not just fill potholes, but create connections, starting with 106 Street and 76 Avenue. In September 2013 the community league knew it was up next in the Neighbourhood Renewal program. QA Crossroads was started to see what could be done within the City’s Neighbourhood Renewal program and eventually spun off a larger volunteer group across all neighbourhoods along the corridors of 106 Street and 76 Avenue. Engage 106-76 has been working to change those problematic roads into bridges rather than barriers. Citizens advocated for crosswalks that would allow connection, walkability enhancements and better bike infrastructure. The work paid off. Today the concept plan includes raised crosswalks, concrete medians to protect bike lanes, and narrower traffic lanes as a traffic calming measure. These changes go beyond what the Neighbourhood Renewal Program usually looks like. But it took two years for Engage 106-76 to get there. *Editor’s note: We had previously characterized sidewalk curb cuts and sidewalk connectivity as “extras” of the regular Neighbourhood Renewal process, in an effort to distinguish what might be new to the look of a neighbourhood after construction. Since both are standard parts of the Renewal process we have adjusted the above details to better reflect that. The Neighbourhood Renewal program started in 2008 and is partially funded through a 1-2 percent levy on property tax annually. The tax has provided $418 million since 2009. That’s about half of the program’s total budget, which also includes revenue from provincial municipal grant funding, additional City funding and some costs covered by neighbours in reconstructed communities. By the time it was Queen Alex’s turn, close to 20 neighbourhoods had undergone the renewal process. But the program was not quite equipped to deal with what Queen Alexandra residents had in mind. The program was originally designed to repair streetwork and surface drainage. It provides additional options on street lamps, alleys and sidewalks, with homeowners chipping in to pay. The Queen Alexandra community league saw the opportunity to instead update infrastructure to reflect current needs and attitudes on urban design and new infill initiatives. Instead of just putting down fresh pavement and new sidewalks, neighbours wanted enhanced walkability, better bike infrastructure, and to re-do the major roads that intersect their neighbourhood in a way that made people feel comfortable traveling along them, no matter the mode of transportation. Using international best practices for urban design, and the City’s own guiding documents like The Way We Move and Complete Streets, neighbours felt they could make a good argument to take advantage of the construction to change how the neighbourhood fit together. Only one year ahead of planned construction, QA Crossroads was formed and created principles upon which it wanted urban renewal to occur. That grew into the larger Engage 106-76 group, which also included members from the City of Edmonton’s public engagement and transportation departments. Developed as a community group, Engage 106-76 began to advocate for urban renewal rather than simply replacing road infrastructure on a ‘like for like’ basis (just putting in new pavement and concrete). The group brought together diverse community members and advocated consistently on principles of walkability and inclusion — at every possible step of the consultation process — and in doing so created a whole new process for how communities engage with the City. Now other communities are hoping to repeat their success. “We decided to be proactive about the renewal and make a plan for the redesign of the neighbourhood,” says Conrad Nobert, chair of Strathcona Community League’s ad-hoc committee on neighbourhood renewal. While the first City consultations for the Strathcona’s neighbourhood renewal won’t happen until this fall, the community league has taken a lesson from Queen Alex and has already formed a consultative group. And it has engaged with design students at the University of Alberta to generate some urban renewal proposals. Nobert, a founder of the active transport group Paths for People, wants to ensure that the roads are re-done with walkability and bikeability for everyone in the neighbourhood. “This was a whole new approach of the pilot project process,” says Jen Rutledge, supervisor of project management with infrastructure planning and design at the City of Edmonton. While the City has a process of consultation for the program, the Engage 106-76 initiative took consultation into its own hands. The community engaged in a process that collected letters of support from community leagues, school board trustees, the Strathcona Complete Streets group, and the Old Strathcona Business Association. 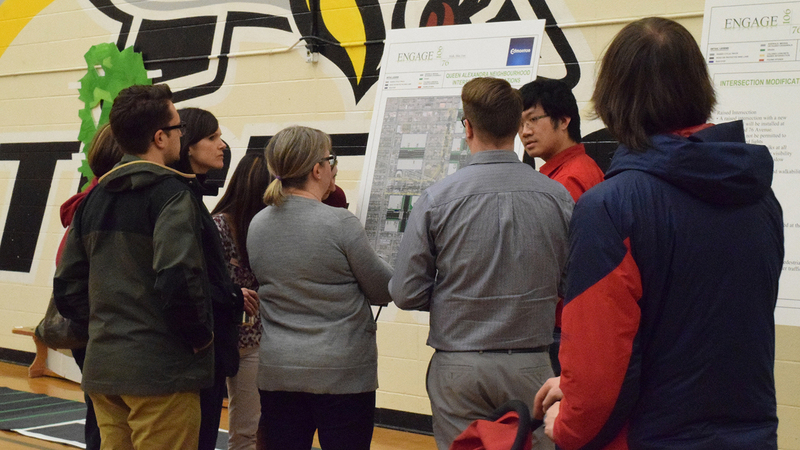 They held their own community consultations, collected stories from residents and researched how their vision of neighbourhood renewal aligned with the City’s policies and strategic documents. Group members even showed up to other meetings that related to their principles, but not necessarily their specific project. The principles have essentially remained intact over the two years: infrastructure that would please all users, bridge neighbourhoods, promote quality infill redevelopment, maximize cycling infrastructure and facilitate traffic flow. Neighbourhood Renewal usually includes a few public meetings for citizens to see what work is planned and provide feedback to the City. It typically begins more than one year before construction is to begin and leaves little room for major infrastructure changes. In Queen Alexandra, the Engage 106-76 core group was made up of volunteers from communities connected along 106 Street and 76 Avenue (Queen Alex, Strathcona, McKernan, Belgravia, Allendale, Pleasantview and Empire Park) and City of Edmonton staff. The group signed up hundreds of “community partners” from the neighbourhoods who filled out multiple surveys, attended open houses and had a mapping workshop in each of the connected neighbourhoods. For Queen Alex residents, this was on top of communication from the City of Edmonton about the regular Neighbourhood Renewal process, which happened in 2016 throughout the rest of the neighbourhood. To build up the Engage 106-76 partnership, volunteers identified key groups to bring into the fold, like the surrounding community leagues, Old Strathcona Business Association, Queen Alexandra and Mount Carmel Schools and their parent groups, businesses and churches along the two roads and other organizations that could have helpful input or feedback on the changes being proposed. The conversation was also repeatedly one about how the roads could be re-designed to best reflect the idea of “walk, bike, live”, instead of asking people if they preferred one option over another (like bike lanes instead of on-street parking, or more lanes of traffic instead of treed boulevards). The discussion was about working together on a shared vision, not competing transportation interests. It seemed to work. The last major open house to solicit feedback had more than 300 attendees, a series of surveys received more than 700 responses, and 87 people turned out to six mapping workshops. The City of Edmonton is now considering Engage 106-76 as a template for how public engagement could happen in more projects and more neighbourhoods. Kusiek credits doing the research and showing up to any potentially related city meetings as the key to their success. By 2015, the City had partnered with the groups to create a cohesive consultation process. “We knew we had the experiences, and not the expertise,” says Kusiek. She says the group wanted to provide as much direction and direct lived experience to planners for them to develop the proper technical answers, but that planners were the experts. But the City is looking at its engagement policies. Engage 106-76 is one of the pilot projects included in a review of the City of Edmonton’s public engagement strategy and could potentially set standards for how consultation is done with communities across Edmonton. “We’re looking at the Engage 106-76 and how we want to do public engagement city-wide as an example,” says Lehman. Those public engagement policies are in front of city council Tuesday, April 11. How Queen Alex’s efforts affect future public consultation, and a neighbourhood’s ability to lobby for necessary infrastructure, is yet to be determined. But Conrad Nobert is already using the lessons from Kusiek and Engage 106-76 in his plans on the other side of Whyte Avenue. “We’re at the generating capacity phase at the neighbourhood level to convince the City to redesign before they invest $25 million in sidewalks,” says Nobert. As the co-founder of Paths for People, he is well-versed in the areas of walkability and bikeability. And he wants to apply the safety and design successes in Queen Alex to all of Strathcona. 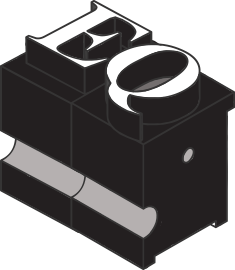 Editor Jeff Samsonow has volunteered with Engage 106-76 and the Strathcona Community League.